Even before I "officially" took up hiking, way back in 1994, I had already climbed Mt Carleton, my home province's highest peak. It was just something one did as a resident of nearby Bathurst, New Brunswick. Back in 2005, Jenn and I decided to climb it in a more official fashion, taking lots of pictures and recording a GPS tracklog. Unfortunately, I forgot to put charged batteries in my GPS, and the late spring weather on the day we climbed was wet, windy, and viewless - so essentially, we managed to mostly achieve neither. 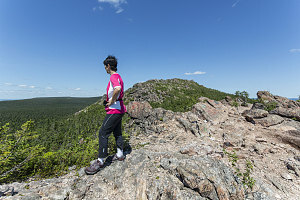 During a week-long visit to my hometown of Bathurst to celebrate my mother's 90th birthday, I decided that a return to Mt Carleton was in order - on a nice day with good visibility, and with a fully-charged GPS. 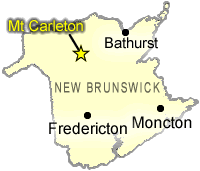 Mt Carleton is the highest point of the province of New Brunswick - and also the highest point of all three Maritime Canadian provinces (NB, NS and PEI). 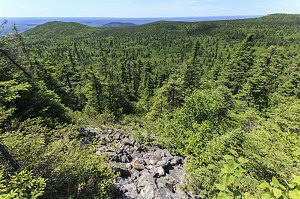 Poking out above the mostly unbroken forests of northern NB, it rises to a modest height of 820m (2690ft). 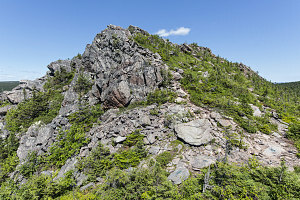 The area is in fact part of the larger Appalachian Range, although in New Brunswick the mountains are not nearly as high or rugged as they are to the south (e.g. in Vermont, New Hampshire, and Maine) or to the north (Gaspe and Newfoundland). 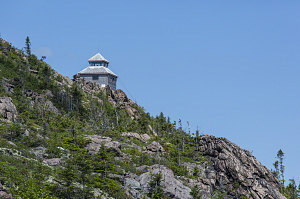 Although Mt Carleton is relatively low, it manages to just barely reach above treeline, and in doing so, provides a very pretty summit experience. 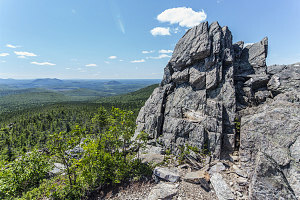 Mt Carleton is located within Mt Carleton Provincial Park, a 174 square kilometre reserve in the New Brunswick highlands, about 100km west of the town of Bathurst and about 130km east of the town of Edmunston. Early on a Monday morning, my sister Elvira and I headed out from my parent's house in Bathurst, driving westward along highway 180 - also known as the "Road to Resources". 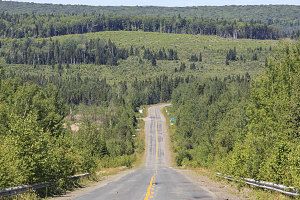 Highway 180 crosses a large stretch of uninhabited country, and it took over an hour to travel from the mostly flat lowlands surrounding Bathurst into into the gently undulating topography of NB's appalachian highlands in the vicinity of Mt Carleton. 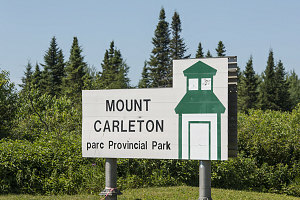 A signed junction along highway 180 marked the turnoff towards Mt Carleton. We followed the road south from here, highway 385, for perhaps 6 kilometers or so, before arriving at the main entrance gates to Mt Carleton Provincial Park. Mt Carleton Provincial Park has, as nature parks go, a strange access setup. There's a closed un-manned gate that always bars the way in for cars. You must get out of your car, go inside, pay the entrance fee, then go back to your car, position yourself at the gate, and then a park employee comes outside and opens the gate for you (and then closes it behind you). And, you can't get in at all before 8am: there's no self-service kiosk for after-hours access, like just about everywhere else in the western world. Very awkward and unusual. One final note: Mt Carleton Provincial Park has an opening and closing time (which I believe is 8 a.m. to 8 p.m., but don't quote me on that). If you drove into the park with a car, I don't know what would happen if you were late returning from your hike and you arrived back at the gate after closing time. Would you be forced to spend the night in your car, trapped in the park? There's nothing on the website or on signs that tells you what happens in this situation. Anyway, after having gained entrance to the park, we stopped briefly at pristine and beautiful Nictau Lake - one of two main lakes (along with Bathurst Lake) that represent the hydrological apex of New Brunswick. 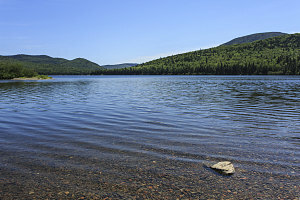 Rising up behind Nictau Lake is Mt Sagamook, one of the three highest peaks (along with Mts Head and Carleton) in the province. 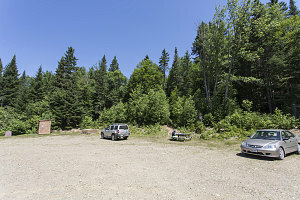 From Nictau Lake, it was about a 14km drive along gravel access roads to the Mt Carleton Trailhead, where there's ample parking for quite a few cars. 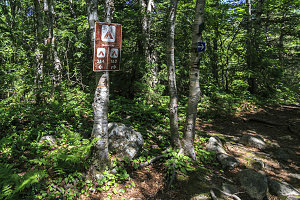 This is where most people start their hiking route up to the top (there are two other ways to approach Mt Carleton on foot, but they involve a significantly longer hike). 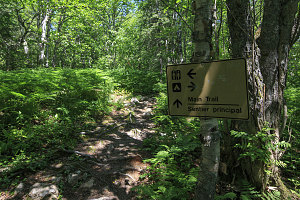 From this, the main Mt Carleton trailhead, there were two options available to us. 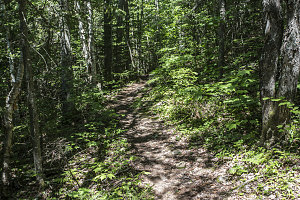 The first was the shortest, most direct trail leading to the summit. 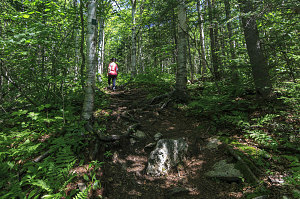 It is a wide, heavily-travelled trail of about 4.5 kilometres. The other options was what I like to call "the longer route" (for lack of a better term). 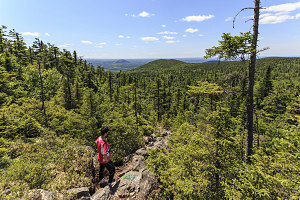 It is slightly longer, at about 5km, but is much less travelled (and hence more pristine and less eroded) and it offers a wonderful section of alpine hiking along Mt Carleton's summit ridge. We chose to do a combination: up the longer trail, and down the standard trail. Under sunny skies, we started off up the "longer" trail. 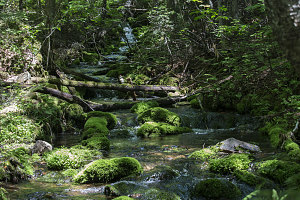 "Up" is a bit of a misnomer, for the longer trail actually heads very slightly downhill for the first kilometre or so, before reaching a small brook which drains part of the western slopes of the Mt Carleton Massif. At this point, the trailed turned sharp right and started up the slopes, parallelling the small watercourse. 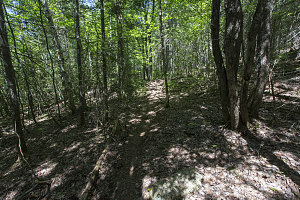 The tread of the trail was dry and not eroded, making for very pleasant hiking. We headed uphill alongside the stream for perhaps a kilometer or so. 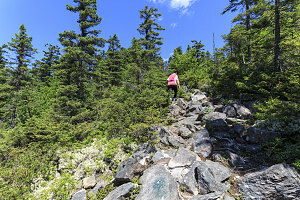 Even the steepest sections of the slope weren't all that steep, and after about 700 vertical feet (200m) of climbing, the trail gradually flattened out as we reached the broad forested plateau of the greater Mt Carleton Massif. 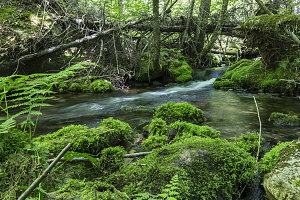 We encountered the signs for the four "Headwaters" backcountry campsites here. Very shortly after the Headwaters backcountry campsites, we came to a prominently-signed junction. 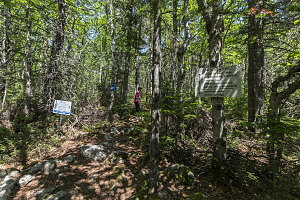 In one direction was a bypass route around the open section of Mt Carleton's ridgecrest. In the other direction was the route up and along the open ridgecrest. This - the final bit of open hiking along Mt Carleton's summit ridge - is the highlight of the entire hike. The trail to the open ridgecrest route was marked with a couple of melodramatic and dangerous-sounding signs: "route on rock ridge USE EXTREME CAUTION" and "ROCK CLIFF Use Extreme Caution". Rock Cliff? I'd been on this trail before, and at no point does the trail climb a rock cliff. In fact, apart from a bit of boulder scrambling, the trail isn't exposed at all (in the "heights" and "dropoffs" sense of the word). The people who made these signs clearly have never been on an exposed mountain path before. If you arrive here and see these signs and you've done pretty much anything in bigger mountains.... well, let's just say you'll do just fine. The ridgecrest route is exposed to the full force of the weather though, so if you are going to go up this way in high winds or rain, make sure you bring the right gear. Needless to say, I was not dissuaded from taking the ridgecrest route. 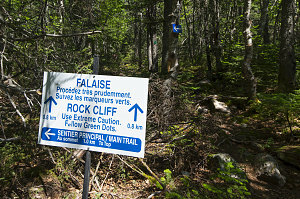 Instead, I was looking forward to the best bit of alpine hiking New Brunswick had to offer. Within five minutes, we had arrived at the first hints of open terrain, courtesy of a couple of open fields of loose talus. The trail from this point up to the ridgecrest is pretty much continuously on this sort of bouldery talus, marked with green splotches of paint here and there. Soon we could see the rocky spine of the ridgecrest not far above us. 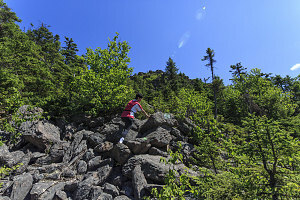 Fifteen minutes of steep boulder-hopping brought us to the crest of Mt Carleton's summit ridge. 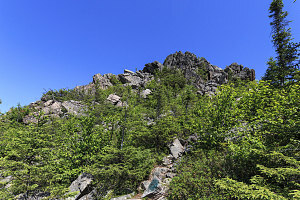 The ridge is mostly cohesive bedrock, and from this point all the way to the summit, the trail is mostly on solid - if rough - footing. Unlike our socked-in view in 2005, today we had picture-perfect clear views to the south, east and west. 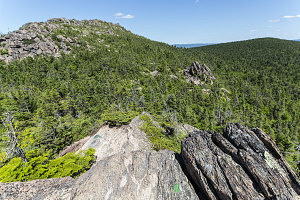 To the north, the craggy spine of Mt Carleton's summit ridge pointed the way to the summit - although the way now involved only slight increases in elevation. We only had about 150 more vertical feet to ascend (40m).